Mudders have to get over this wall to simply reach the start. The prevailing wisdom: if you can’t get over the wall, don’t bother. Honestly, this was the most intimidating part. We crammed ourselves at the Tough Mudder starting gate like rabid rock fans inching closer to the stage. 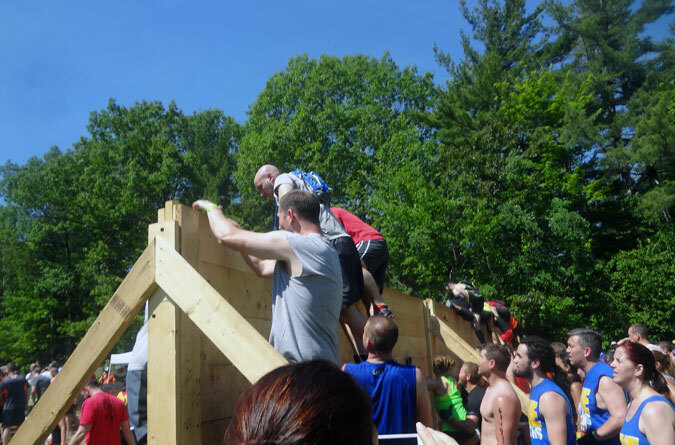 Standing still was sweat inducing in the scorching 90-degree heat, which is to say the 12-mile obstacle course over Gunstock Mountain Resort promised pure hell. Somewhere between the wall we had to scale to simply reach the start and the MC telling us to take a good look at the women around us, “This is the best they’ll look for the next three hours,” stomach butterflies metamorphosed into an adrenaline-fueled drive: let’s do this. “I understand that Tough Mudder is not a race but a challenge,” we recited, taking the pledge for teamwork and camaraderie. The national anthem blared. A moment of silence for those touched by the Boston Marathon bombings. And we were off, plumes of red smoke greeting our assault of the steep mountain slope, twenty military-style obstacles aptly named Trench Warfare, Arctic Enema, Firewalker, Mud Mile, Berlin Walls, Everest and Electroshock Therapy awaited. To think I’d originally said no to this. “No way,” was more like it. 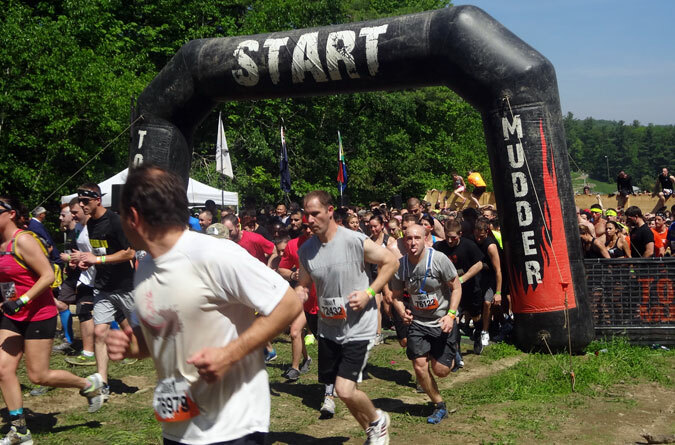 To me, Tough Mudder was something done by Superman triathletes and bored Navy Seals. Neither of which do I meet the minimum badass BMI requirement. If I wanted to ride a high horse, the questionable business ethics of Tough Mudder’s founder, as chronicled in Outside Magazine, was a serviceable excuse. Candid honesty: I had a love/hate relationship with running—as in, I loved to hate it. Hi ho, hi ho, off to a beating we go. “Don’t worry,” my coworker said, going on to explain that Tough Mudder truly is more of a team sport than an individual race. Yes, there’s a fair share of superfreak athletes who partake, but the vast majority of participants consider carb loading a pizza and a six pack. My interest was piqued, and if I was being honest with myself, I was probably in from the start. Something about being the same age as retiring professional athletes, coupled with a desire to take my son hiking and kick around the soccer ball as he gets older, has unlocked a masochistic gene in my DNA insistent upon flipping father time the finger. So it was that Tough Mudder became my mid-thirties crisis. The only obstacle between myself and the course at this juncture was the “Death Waiver” (yes, they actually call it that), which I made the mistake of reading. The waiver states that you can’t sue Tough Mudder. For any reason. Whatsoever. If you get hurt, too bad. Die (sadly, a few have), you and your surviving family are out of luck. If injury or death is caused by faulty obstacles, well, that’s your bad for not carefully inspecting the construction. You don’t actually get to pre-inspect the obstacles, of course, that would be a liability. In short, the Tough Mudder lawyers are very good. They’ve thought of every inconceivable circumstance. The first of four climbs up the mountain. 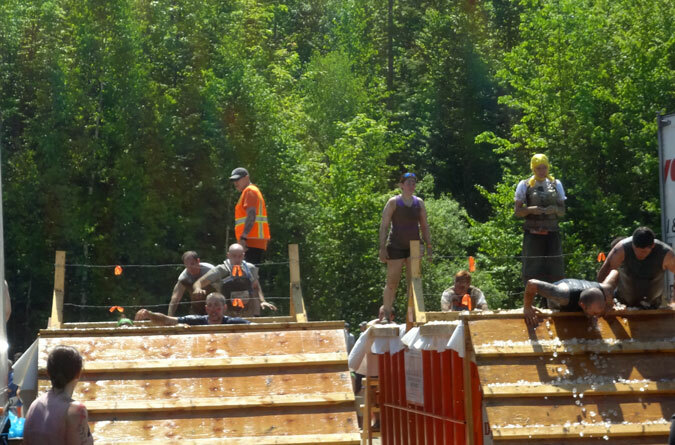 The course itself took the cake for the toughest obstacle. While there were water stands along the way, I was really glad I wore a runner’s hydration pack. It never posed an issue on the obstacles because I was able to throw it aside for the tunnels. I, on the other hand, am not nearly as thorough, which explains the following exchange with my wife. To set the scene, this occurred when she walked into the room minutes after I’d signed up. “Oh man…uh oh…wow…” I was muttering to myself. The videos scared me stupid. Into running. My daily morning two-mile jaunt, something I’d begrudgingly done to keep the trail legs nimble between hikes, immediately grew to three. Occasional lunchtime runs with my Tough Mudder team started at five miles and grew from there. Running is a disease that spreads throughout both mind and body. I’d always cowered on mountains from trail runners, afraid of their rabid bite, but now I found myself thinking, “Franconia Ridge must be a great run.” Or, “I bet I could run the Presidential Traverse.” Worse yet, these seemed like genuinely good ideas. Only when I logged back-to-back nine-mile runs did it hit me: Oh $%!#, I’m a runner. How could this happen? The Kiss of Mud obstacle served as a convenient excuse to take a break from the course. We ran out of the starting gate and up the initial climb, weaving through people smartly reminding their teammates to pace themselves. Our strategy was to get ahead of the pack before the first obstacle, and it worked. Sort of. With a herd of participants being released onto the course every fifteen minutes, it wasn’t long before we caught people from the previous group. Crowding at the obstacles was never an issue, though. We quickly learned lines were shortest at the ends, and I don’t think I ever had to wait more than a minute or two. 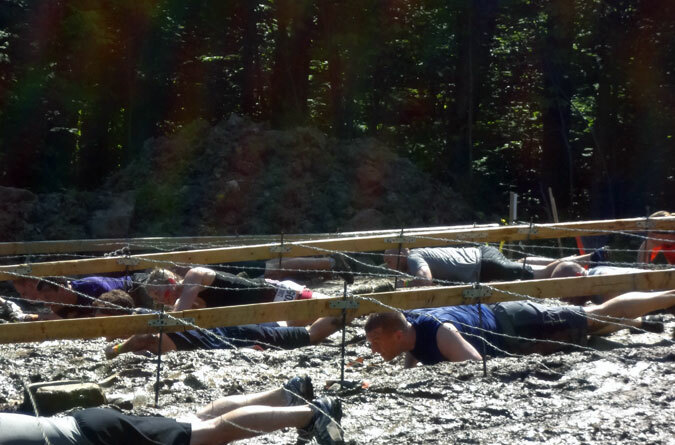 The first obstacle we encountered was Kiss of Mud, a crawl under barbed wire suspended eight inches off the ground. The only challenge here is staying low, which in itself isn’t hard, but I did see one woman get her ponytail caught in a barb. At the end of this we were all pleasantly caked in mud and many people had lost their number bibs. I was also wishing I’d worn a bandana because with a shaved head I now had nothing but a muddy shirt to wipe sweat and sunscreen out of my eyes. Before I could rectify this problem we were at Trench Warfare, a tunnel crawl meant to intimidate the claustrophobic as there’s little to no light in the middle. I suppose it could also be difficult for tall people. At 5’9, I had plenty of room to crawl on my hands and knees. Entering the Arctic Enema required a moment of silence for all manhood. Of the “oh no” obstacles, Arctic Enema, an ice bath, was the first real challenge. There’s no way to sugar coat this one: it’s cold. Really frickin’ cold. That said, you’re in and out so quickly that it’s more invigorating than anything (at least on a 90 degree day, anyway). Electric Eel, a water crawl through dangling electrical wires was another to raise the pre-event heebie-jeebies. All for not. Maybe I was lucky to not hit a “live” wire, but I never felt it. I’d also had concerns that Cage Crawl, an open tunnel of water covered by fencing, would have enough breathing room, and this one ended up being my favorite. All we had to do was float on our backs and pull ourselves along the fence. With the severe heat I wanted to do this one a second time. Mud Mile, a long procession of trenches, was one that turned out to be more difficult than it looked. The first half was fun and easy, but by the end it morphed into a grind. The 12-foot tall Berlin Walls presented another formidable challenge; thankfully a boost from a teammate got me up the walls. While perched atop the first wall, it was a little disconcerting to look over the backside and see a staff member drilling screws into the support beams. I suppose this is why it was my responsibility to pre-inspect each obstacle. Fortunately I didn’t pull a Humpty Dumpty. 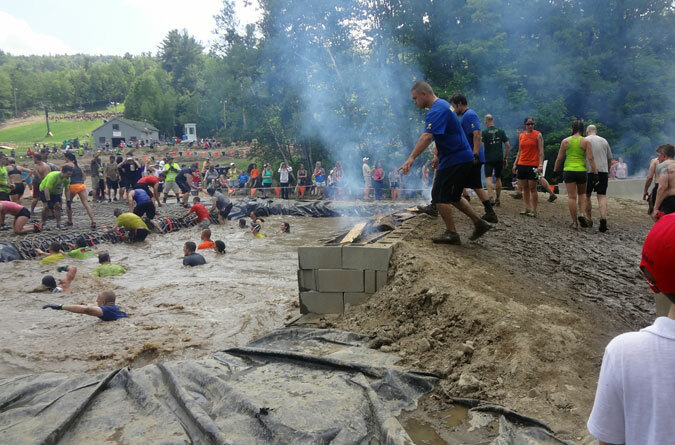 The Fire Walker obstacle was a quick leap over flames into a muddy pool. 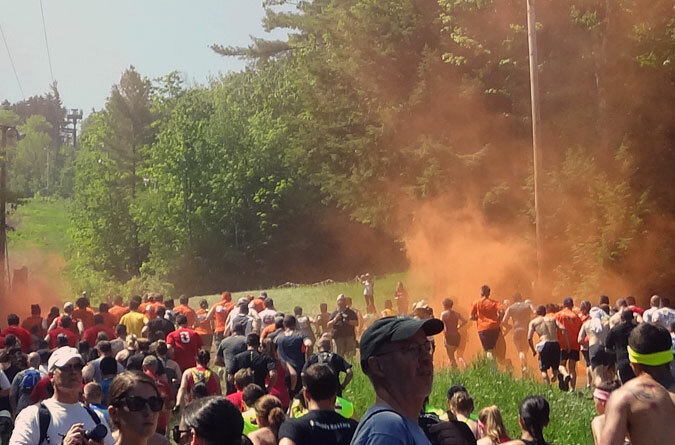 For the most part the obstacles at Tough Mudder Boston were welcome distractions from the course. “Don’t whine, kids whine,” read signs along the grueling climbs of Gunstock Mountain. After the third ascent we passed the 11-mile mark and incorrectly assumed we were in the homestretch. No sooner did this thought cross our minds than the course turned back up the mountain. It was here being a hiker was a distinct advantage—not only in climbing conditioning, but also the mental preparedness from the disappointment of false summits. 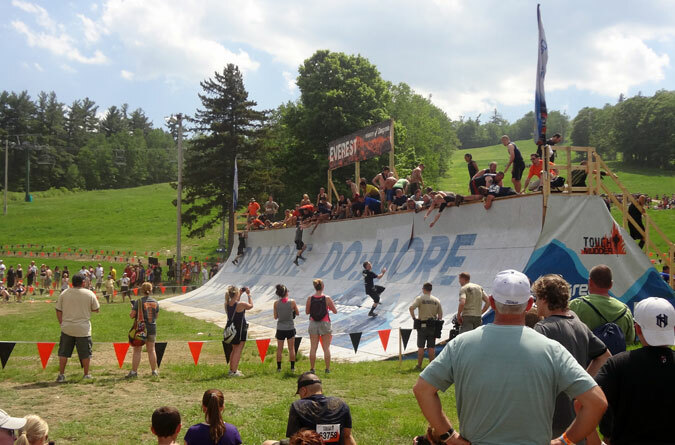 And then there was Everest, Tough Mudder’s signature obstacle. This quarter-pipe climb epitomizes the entire experience because it requires a mixture of physical stamina, teamwork and blind faith. I ran at the pipe with no idea what was going to happen next. Would I make it to the top? Face plant halfway up? There was only one way to find out. I surprised myself when I grasped the outstretched arm of a teammate at the top of the pipe. Everest, the second to last obstacle, was easily the course’s best. The well-guarded secret of Tough Mudder is that the event is only as difficult as each participant makes it. Everyone is encouraged to detour around any obstacles they’re uncomfortable with or unable to complete. Nor is there any minimal running requirement. Because it’s truly not a race, it’s up to each individual to set their own goals. This isn’t to say the event shouldn’t be taken seriously. I included the bit above about becoming a runner because proper training is all part of the experience. Being prepared for the grueling course gives participants the option of making it as hard as they want. Coming straight from the couch leaves only one difficulty level: torture. I’m glad to say we had fun.